Organophosphorus hydrolase (OPH, EC 8.1.3.1), also known as Aryldialkylphosphatase, is a remarkably stable homodimeric enzyme that can detoxify organophosphate compounds. Organophosphate compounds are the basis of numerous pesticides (e.g., malathion) and chemical warfare weapons (e.g., sarin, VX). Organophosphates act by blocking the action of the enzyme acetylcholinesterase. Overuse and misuse of organophosphate pesticides are major causes of acute pesticide poisoning and death. See also here. Boris N. Novikov and colleagues with the Department of Biochemistry and Biophysics at Texas A&M University, reported in the Journal of Controlled Release on the effects of modifying organophosphorus hydrolase (often abbreviated OPH) with linear and branched PEG derivatives. The group chose these PEG reagents because conjugates altered by PEGs see “their immunogenicity is reduced and the renal excretion is slowed considerably, leading to prolonged half-life, reduced side effects and increased treatment efficiency,” C.S. Fishburn, The pharmacology of PEGylation: balancing PD with PK to generate novel therapeutics, J. Pharm. Sci. 97 (2008) 4167–4183. PEG derived conjugates, specifically discrete linear and branched PEGs, were used to help generate data on the biochemical, biophysical, and pharmacological properties or organophosphorus hydrolase. The discrete PEGs chosen were all terminated with a methoxy group at one end of the PEG linker and functionalized with an NHS ester on the other end of the linker to react with surface-accessible lysine residues, forming an amide bond between the PEG linker and organophosphorus hydrolase. The linear, discrete PEGs had spacing lengths of 16.4Å (PEG4), 30.8Å (PEG8), and 44.9Å (PEG12), while the branched, discrete PEG chosen is shown in Figure 1, below. All of the PEG linkers used were made by Quanta BioDesign Ltd. and purchased through Quanta BioDesign distributor Thermo Scientific (formerly Pierce). Figure 1: The branched discrete PEG used in this research to modify organophosphorus hydrolase. Attaching the PEG linkers altered the biophysical properties of organophosphorus hydrolase. Specifically, the catalytic functionality (kcat) decreased for all PEGylated species, but the enzyme retained substantial activity of 30% – 60% depending on substrate. Moreover, the substrate affinities of the modified enzymes increased (thus, kM decreased), which meant that the overall catalytic efficiencies of the unmodified and modified enzymes were comparatively close. In animal testing, unmodified organophosphorus hydrolase had a circulated half-life of 0.86 hr and a mean residence time of 1.1 hr. 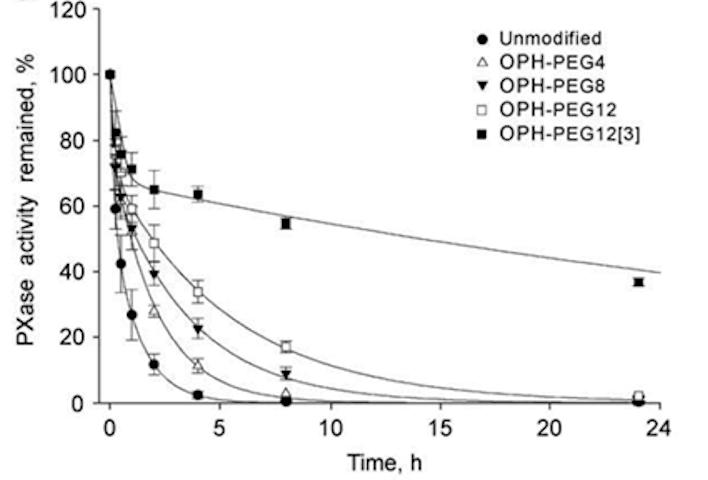 PEGylation of the enzyme even with the smallest PEG (PEG4) increased the circulated half-life and mean residence time of the modified enzyme compared to the unmodified enzyme. PEGylation with the large branched PEG (Figure 1, above) resulted in a dramatically longer circulated half-life (32.5 hr) and mean residence time (46.7 hr). See Figure 2, below. Moreover, injection of unmodified organophosphorus hydrolase into test animals caused formation of antibodies to the enzyme. 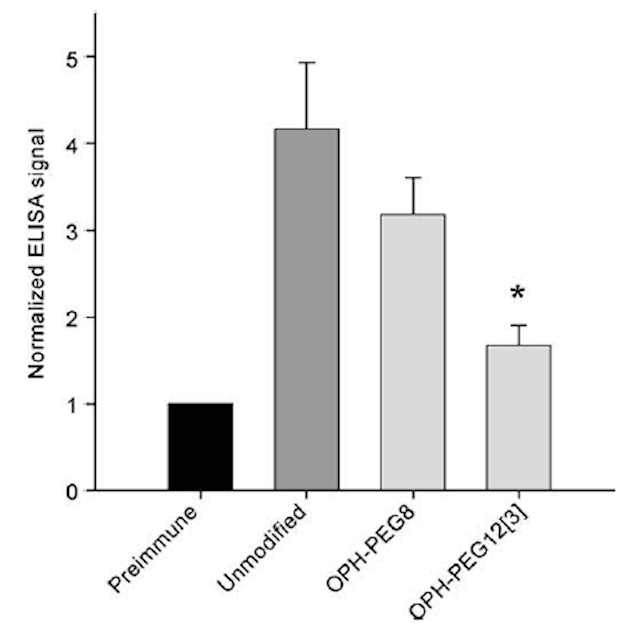 Injection of the PEG-modified enzymes into test animals slightly reduced, but did not prevent, formation of antibodies to organophosphorus hydrolase. The differences in antibody formation between the linear PEG4, PEG8, and PEG12 were not statistically significant. By contrast, though, antibodies formed to the enzyme modified with the branched PEG12 (Figure 1) were significantly less compared to the unmodified enzyme. See Figure 3, below. Quanta BioDesign, Ltd. is the developer and leading innovator and manufacturer of discrete PEGylation reagents. We look constantly for new collaborations and opportunities for custom synthesis in creating new dPEG® products. Our customers’ ideas drive the creation of many new products and have given us many popular products. We scientists and Quanta BioDesign are committed to developing new dPEG® constructs for all types of applications including diagnostic, therapeutic, theranostic, and nanotechnology uses. All ideas are welcomed, and we look forward to helping your research by providing the PEGylation reagents necessary for your research and manufacturing needs, whether you need milligrams or multiple kilograms. For information about any of the PEGylation reagents we make, custom synthesis, or to order products visit us at www.QuantaBioDesign.com. Adam Fulkert, B.S. – Received his B.S. in Chemistry from The Ohio State University in the autumn of 2011. Adam is a Process Development Chemist involved in process development and scale-up activities. Hi, and thanks for that question! The authors used guinea pigs weighing 300-350 grams each. There were 6 guinea pigs in 2 groups per variant. The unmodified organophosphorus hydrolase (OPH) and the PEGylated derivatives were injected intravenously at a dose 0.75 mg/Kg, which the authors state is 500-1000 units of total hydrolase activity. OPH activity in the bloodstream of the guinea pigs was tested by drawing blood at specified intervals and testing in a 96-well plate monitoring for formation of p-nitrophenol from Paraoxon at 405 nm. Again, thanks for your interest. Please let us know if you have more questions.